The Roundtable. : The Sphinx Unearthed! A team of esteemed archeaologists have spent years unearthing one of man's greatest and most mysterious treasures, the ancient Sphinx. The find has been soberly reported in major newspapers and and science journals this past week. 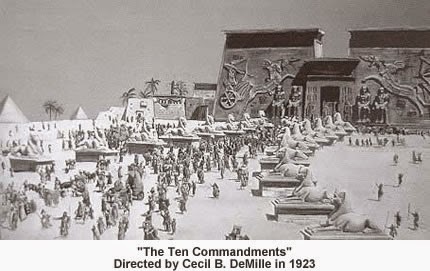 Only this Sphinx is the one that was built for Cecil B. DeMille's first version of "The Ten Commandments," which was made some 90 years ago in the ancient, mysterious town of Los Angeles. It's made of plaster and is in rough shape, being buried in sand and all (see: Original Sphinx.) But these scientists have brought it above ground, and the old artifact can now be seen by grateful future generations. It was, just as an aside, one of 23 Sphinxes built for the movie. This much-newer Sphinx is also yielding treasures from its insides, just like the ancient pyramids. The archaeologists have found old tobacco tins and cough syrup bottles, which probably held something a little livelier in those dark days of Prohibition. The whole episode is perfect fodder for an epic Hollywood satire. Can you imagine the egomaniacal lead archaeologist (I'm not saying there is one in real life) acting as though he had found something just as important as the real Sphinx? And can you imagine him clashing with the egomaniacal documentary film-maker recording the historic event? An epic clash of egos over a plaster cat with a pharoah's face! It's great!